With Certificates of Authenticity. Includes the Gold 5 Pounds, Silver 5 Pounds and Silver 5 Pounds Piedfort Coins. 3 coins total. Description: With Certificates of Authenticity. 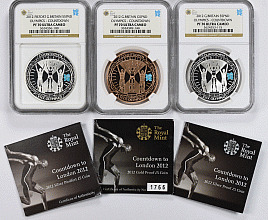 Includes the Gold 5 Pounds, Silver 5 Pounds and Silver 5 Pounds Piedfort Coins. 3 coins total.